TSA guidelines state that you can’t carry onto a flight any bottle containing more than 3 oz. of fluid, also known as the 3-1-1 rule. That means all of your toiletries, from shampoo and condition to contact lens solution. The only exclusions to this rule are medications, baby formula and food, and breast milk. Unfortunately, as necessary as toothpaste, hair gel, and perfume may seem, they’re not included on the exceptions list. So what are you supposed to do? Who buys shampoo in 3 oz. bottles? Only fools and folks looking to get through airport security! So, not one to play the fool, I’ve don’t buy sample sized toiletries from the store. 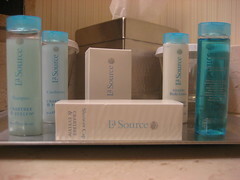 My personal favorites are the little soaps, shampoos, lotions, and conditioners from hotels. You’ve already paid for them, when you paid for the room, so you might as well take them with you if you haven’t used them up. There is a downside to this strategy, you won’t be able to get toothpaste this way. Most hotels don’t include toothpaste in rooms, so for that you’ll have to rely on samples or buy them at the store. Number two on the list, number one for toothpaste, is requesting samples from companies giving stuff away. You can usually find loads of websites giving away samples of product, just do a quick search on Google and you’ll be inundated with sites giving stuff away. If you haven’t been to a hotel lately or you’re just in a pinch, you can always buy the sample sizes from your local grocery store or drugstore.